Ice cream is amazing — even more amazing when it is hot and muggy outside. Try elevating your sweet treat game to the next level with salted caramel. This recipe is a great base to make just about any ice cream flavor you would like. The salted caramel can also be used to make anything tastier — from coffee to fresh fruit. Quality dairy makes quality ice cream. I like to use local milk and cream that has been pasteurized but not ultra-pasteurized. Dairy flavor is sweet on its own, so the less pasteurized the dairy product, the more natural sweetness it has. Watch the sugar. Too much sugar and your custard won’t set up; it will seem slimy, and may not even freeze. Although granulated sugar is what most recipes call for, you can use brown sugar, honey, agave, maple syrup or any other sweetener. Use egg yolks, not whites, in your ice cream. Save the whites to make meringue, consommé, soufflé, egg white omelets, angel food cake or more. First, temper the egg yolks and warm dairy together to avoid scrambling the egg yolks. This process is important. If you just toss the yolks into the cream and heat them up, you risk scrambling the egg; the same thing will happen if you toss the yolks into already heated cream. To temper the mixture, first add a small amount of hot cream to the yolks, and stir until they gradually warm. Then, add that mixture to the remaining hot cream, and heat slowly until thickened. Before continuing, strain the mixture to ensure there are no scrambled bits. This intermediate cooling step may seem redundant, but if you freeze the custard before it cools, the butterfat in the milk with not re-emulsify. This will cause larger ice crystals in your ice cream. Starting with hot custard also causes wear and tear on your ice cream machine. Custard will freeze rock solid without churning. 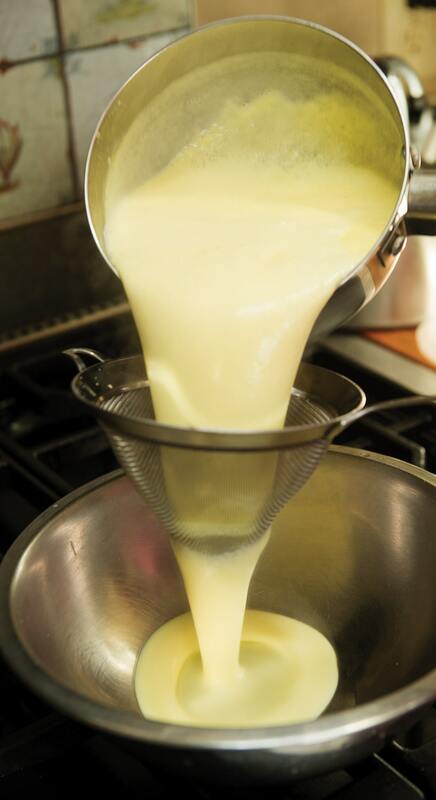 The act of churning while freezing the custard incorporates air and prevents large ice crystals from forming. There are typically three methods to make this happen. In a self-freezing ice cream machine, the custard is churned with a blade called a dasher while a built-in refrigerant cools the outside of the bowl. An actual freezer is necessary to cool down the bowl. These larger and more expensive machines are typically found in commercial establishments, but they work well. The ice and salt ice cream machine keeps the custard in a closed container with the dasher. A mixture of ice and salt surrounds the outside of the custard container. The salt melts the ice so that it remains below freezing without becoming a block of ice around the container. The frozen bowl machine is probably the most popular home model. The insulation of the bowl is made of a substance similar to an ice pack. The bowl is frozen, then, filled with the precooked and cooled custard. The paddle or dasher is added to a top that holds the dasher in place. The bowl spins while churning and freezing the ice cream. In a medium saucepan, bring all ingredients — except yolks — to a simmer, and remove from heat. Place yolks into a bowl, and gradually whisk in a small amount of the warmed liquid (a few ounces) until the yolks are warmed. Whisk the yolk mixture into the warmed cream/milk in the saucepan, bringing to a simmer, until mixture has thickened slightly. Remove from heat and strain. Transfer to a bowl or other container, and put into the refrigerator for 4 to 6 hours to cool. Once cool, place the mixture into an ice cream machine, and run until ice cream is about the thickness of smooth peanut butter. Replace milk with crème fraîche. Add ¾ cup chocolate chips when bringing cream/milk to simmer. Fold in any kind of fruit, nuts or candy after churning and before freezing. Replace sugar with brown sugar and fold in toasted nuts before freezing. Replace the vanilla extract with the scraped inside of a vanilla bean; and the whole bean while bringing cream to a simmer. Replace milk with 8 ounces of cream cheese. Caramel is caramelized sugar. 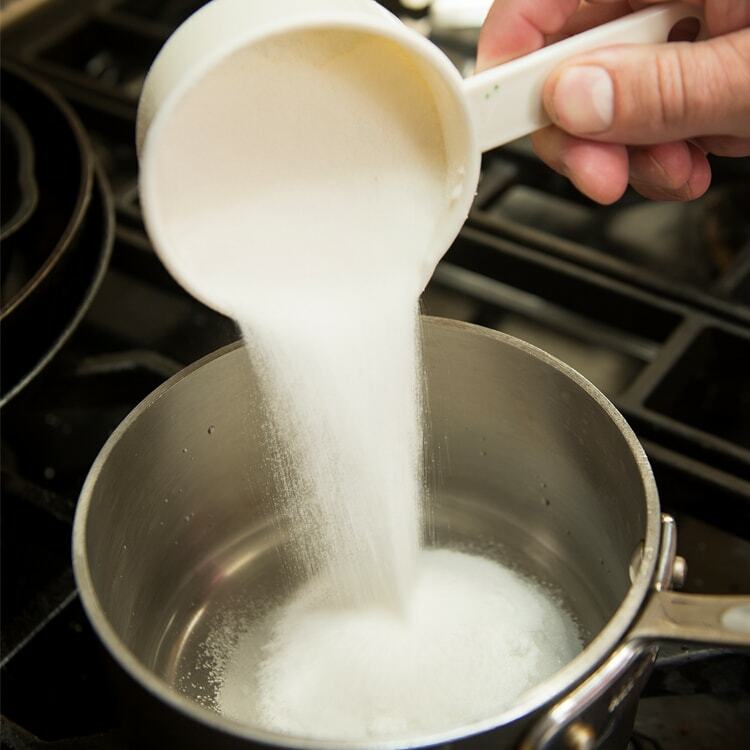 The sugar needs to reach about 340 degrees over medium to low even heat. I have added water into this recipe to help dissolve the sugar. This recipe uses butter but other fats work, too. Bacon, duck or goose fat or lard will richen the sauce and provide distinctive flavor depending upon the direction of your sauce. 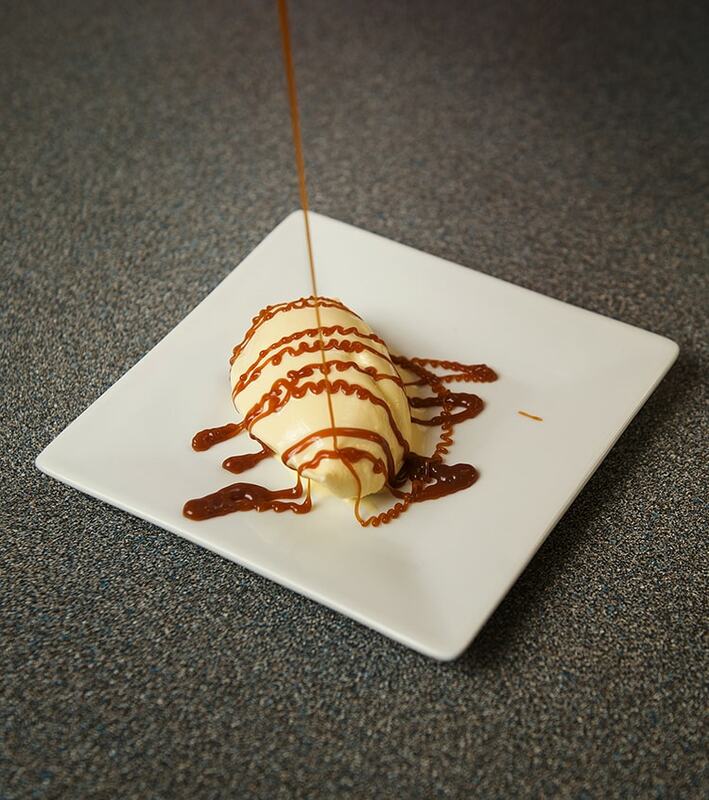 You need to have about a 1:1 ratio of pure fat to liquid to have the nice consistency of a caramel sauce. 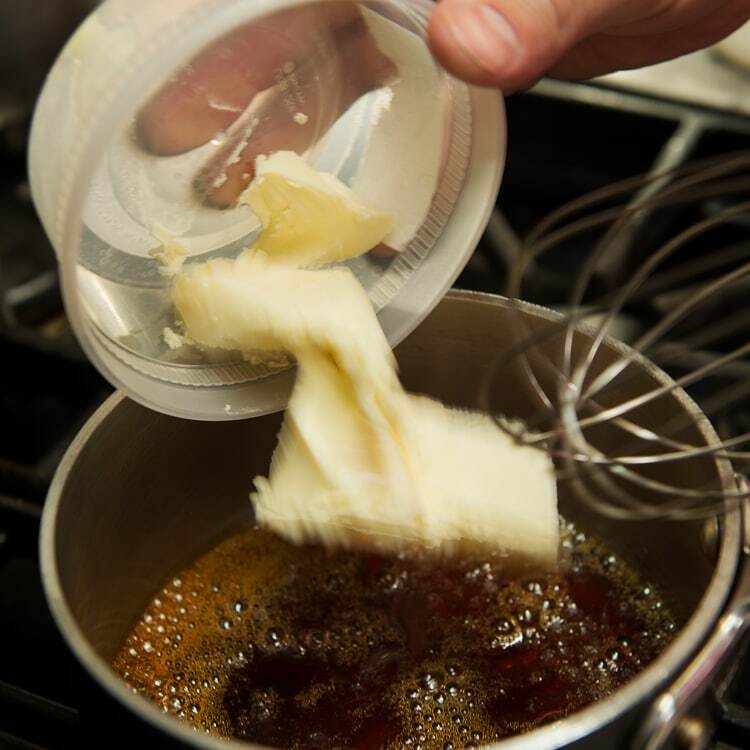 Butter is about 80 percent fat and cream is only about 40 percent. 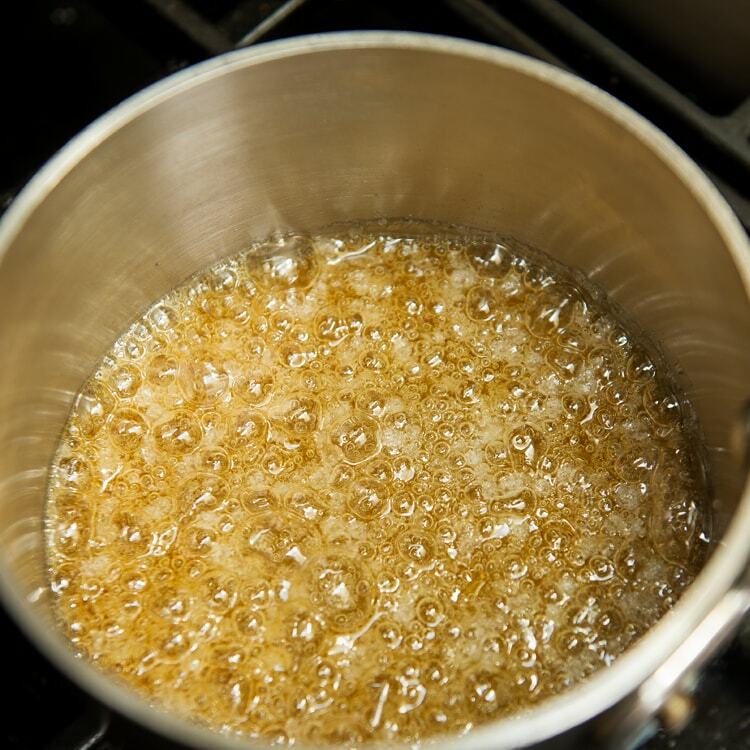 The addition of both the fat and cream to the hot caramel will help cool down the hot sugar, but they will also create some dangerous steam in the process. Make sure you use a long whisk or spoon while adding. Caramel sauce on its own is very delicious, but there is something about just the right amount of salt that can help bring it all together. A salty and sweet sauce can make a good dish great. 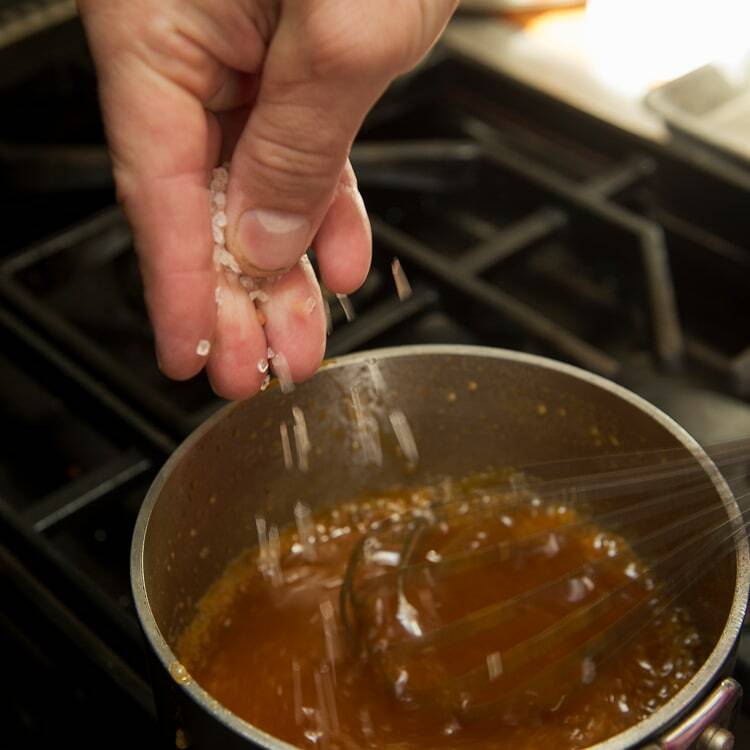 It may take a few tries, but adding salt to the hot sauce, and then more if needed when cool, can really help make the sauce “pop” to the flavor! 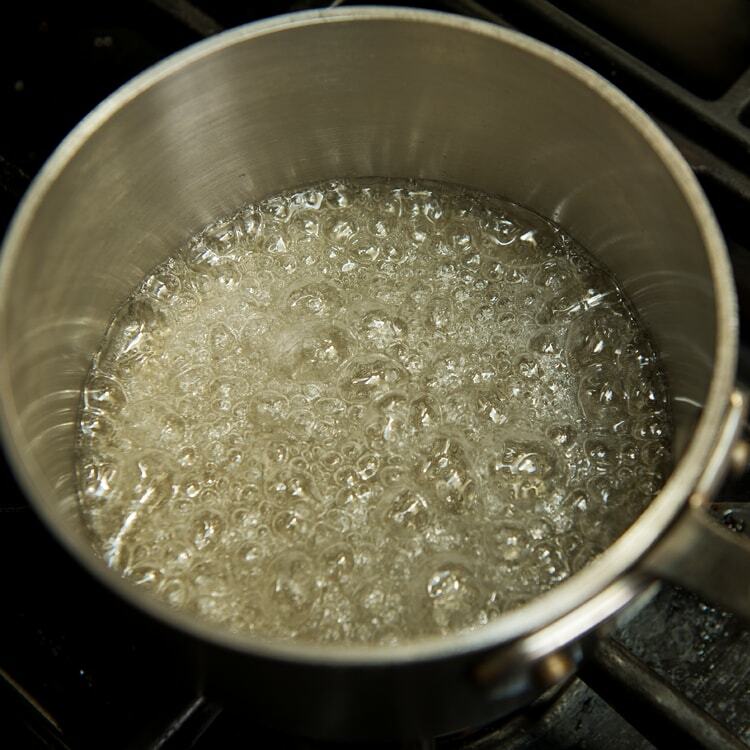 Bring the water and sugar to a simmer in a saucepan over medium to medium-low heat. The sugar needs to reach about 340 degrees. As the sugar starts to dissolve, keep an eye on the side to see if the sugar starts to crystalize. As crystals form, brush the side with water to dissolve back into the mixture. Once the caramel has become the amber-brown color of your preference, move to a cooler part of the stove and let sit for 30 to 60 seconds. 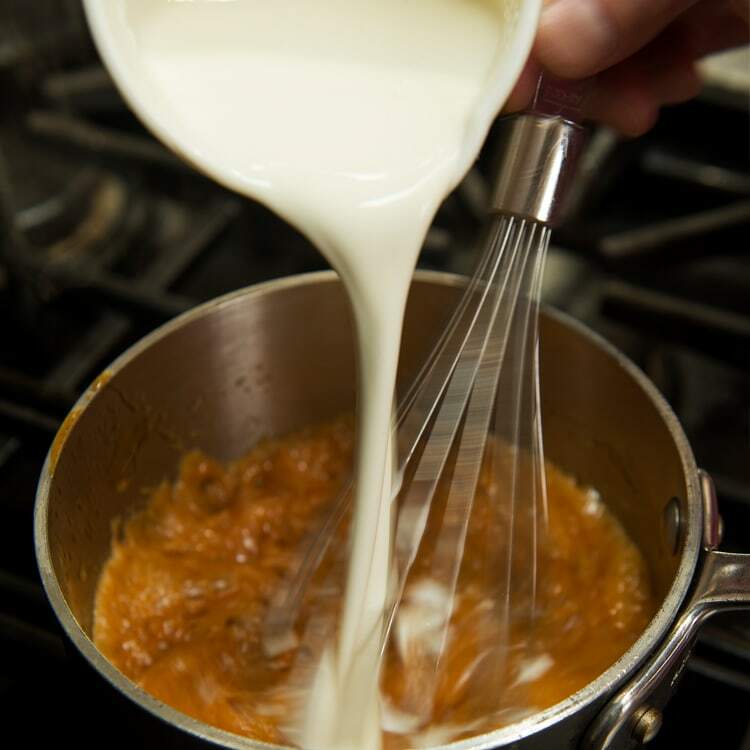 Whisk in butter then cream until dissolved and emulsified into mixture. Add 2 or 3 large pinches of sea salt or kosher salt. Allow to cool until ready to use. More salt to taste can be added after the caramel is cool. Will keep in refrigerator for 2 to 3 weeks.